Sound mods, 4 Level Accent mods, 32 Banks of Memory and MIDI. prices-au/ Prices for Australian customers. 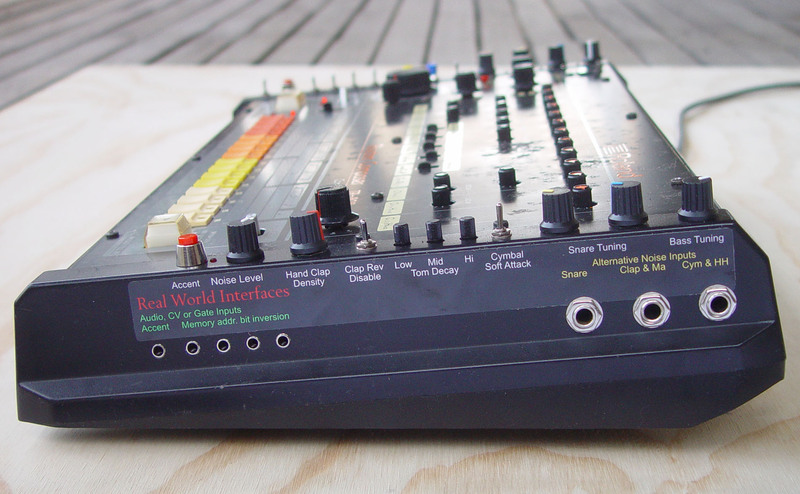 To the Real World Interfaces page, including links to TB-303, TR-606 and TR-909 modifications. To to the main First Principles site. ABN 29 836 876 922. I have been modifying TR-808s since the early 1980s. In September 2012 I made these modifications available again, with some improvements. Please see sounds/ for some demo sound recordings. Sound samples MP3, WAVs and via SoundCloud. 32 Bank Memory with 2 or 4 channels of Dynamic Bank Switching. MIDI In and Out, MIDI In and MIDI In Sync only. #switches Switch replacement, cleaning and various repairs. New battery arrangements for retaining memory data. TR-808-switches/ For technicians: notes on repairing or replacing TR-808 switches and pots, especially the Start / Stop and Tap switches. There are 5 toggle switches, moving side-to-side, and a pushbutton switch. These are located on the front left side panel. This provides 32 complete sets of the TR-808's original memory. The main purpose is not so much to provide more pattern and track memory, but to allow the switching of memory banks while the machine is playing patterns. The CPU reads from memory for each beat, so this enables switching to another pattern in the middle of a pattern rather than waiting for the current pattern to end. This means fresh notes can be dropped in with the flick of one or more switches. The 32 banks are selected by the 32 combinations of the 5 toggle switches. The pushbutton reverses the bit produced by the front (bottom) toggle switch. This memory system is also available with a two or four channel Dynamic Bank Switching (DBS) system. This enables externally applied audio or CV signals, via 3.5mm sockets on the right side of the machine, to alter which of the 32 memory banks is selected. This means that the internal sequencer will play different patterns and one or more individual beats from different patterns in response to these signals. The 32 Bank Memory System is available with two or four channels of Dynamic Channel Switching: either two or four 3.5mm Audio/CV input sockets (each with a detector circuit and LED, with a threshold of about +1.15 volts) which, when activated, inverts the address bit produced by two or four of the four toggle switches which supply four of the five address bits to the 32 Bank system. They are mounted on the right panel, below the Noise Level pot and the Accent switch. 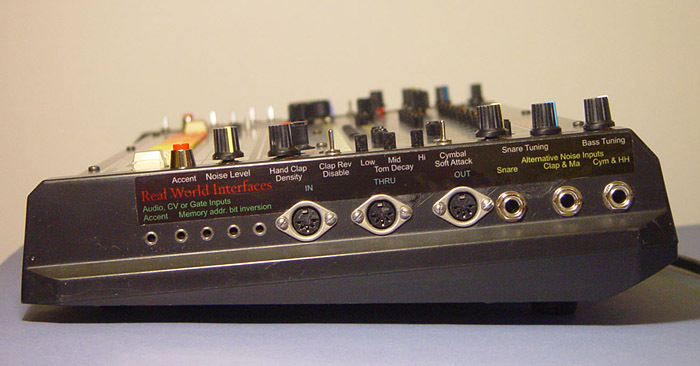 Below is a photo showing the 4 Level Accent mods (described next) and the 32 Bank Memory system controls, with the 4 LEDs indicating the state of the 4 Audio/CV input detectors, which when On, invert the address bit generated by the corresponding toggle switch. The front switch is to the left and its 0 is not inverted by the red push button being pressed. There is no DBS inverter circuit for this bit 4. The next two toggle switches are to the right, so their bits 3 and 2 are 1 and 1. There is no inversion since their Audio/CV detectors have not been activated. The next toggle switch is to the left, which produces bit 1 as 0, and its Audio/CV detector has been activated, so its LED is on and the inverter turns the 0 into a 1. The final toggle switch for bit 0 is to the left, producing a 0. There is no inversion since its Audio/CV detector has not been activated. 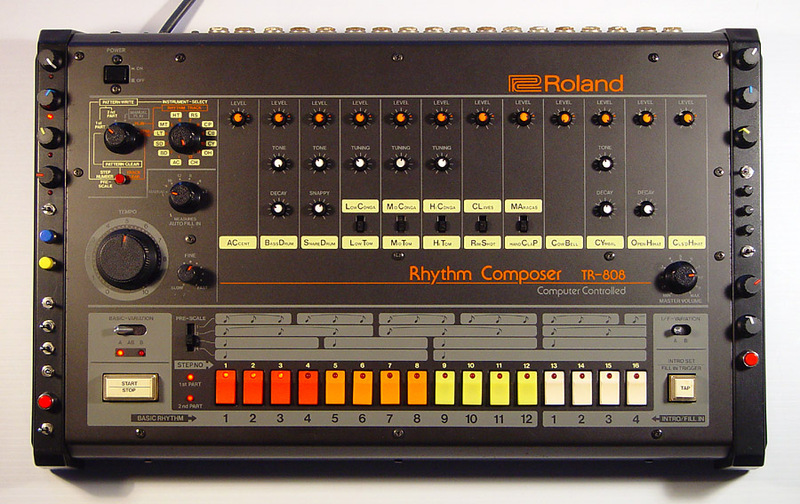 The TR-808's drum circuits are triggered by pulses which start at 0 volts, rise to a certain voltage for 1 millisecond, and then fall to 0 volts again. The 4 Level Accent Mods enable normal operation of the Accent system (a 5 volt trigger pulse on non-accented notes with a 5 to 14 volt trigger pulse for accented notes) and a new mode of operation. In the new mode, the trigger voltage for triggering all the activated drum sounds on the current beat comes from one of four pots. One of these will be selected on each beat depending on whether the Accent and the Cowbell is programmed. Each such selection is signaled by a flash of the LED below the knob. While the internal sequencer is playing a pattern (or being switched between patterns with the 32 Bank Memory System), the dynamics of the pattern can be completely altered by turning the four knobs. The toggle switch selects between normal and 4 Level Accent mode. The blue and yellow pushbuttons over-ride the Instrument Select switch so the TR-808's buttons and LEDs work with the Accent and Cowbell respectively, rather than whatever drum channel the Instrument Select switch selects. This makes it easier to program the desired Accent-Cowbell combination on any of the 16 beats. These 4 Level Accent mods are identical to what I installed in the early 1980s, except that I am now using slightly smaller knobs with metal-shaft pots. The earlier pots were not as robust as I would like. The Hand Clap Trigger output will not activate on beats with a trigger voltage close to the minimum. This might be annoying but I think that in general it is more musically useful to have it this way than to add extra electronics to make the trigger output work irrespective of the trigger voltage. Please see sounds/ for some sound recordings in which I demonstrate the operation of the Sound Mods and the Four Level Accent system. * The Bass Drum decay range is extended to include self-oscillation, so any decay time from the normal minimum to infinity can be achieved with the Decay knob. Sharper attack for the Snappy noise pulse. Reduced cutoff frequency in the Snappy noise pulse high pass filter, to make it gutsier in the lower mid-range. The two tonal components of the sound are boosted in level. The Snare sound is composed of the Snappy noise pulse and the ringing of two "Bridged T-Network" (as the Roland service manual describes them) resonators, with the Tone pot controlling the mix of the outputs of the two resonators. There are two Snare Tuning pots, one for the upper resonator (blue knob) and one for the lower (yellow knob). Tuning is at the normal pitch when these pots are anticlockwise (ACW) and is reduced by around an octave when they are clockwise (CW). The Cymbal Soft Attack switch (above the three small pots), when in the right position, gives more of a ride cymbal sound, compared to the normal crash sound. The attack is soft and the decay is somewhat extended. The Tom/Conga circuits each have a Decay pot, where ACW is the normal decay time and CW is a much shorter decay time. These are the three small pots with silver indicator lines. The Hand Clap sound is composed of a series of close-spaced pulses of filtered and distorted noise plus a softer pseudo-reverb exponential decay pulse of softly filtered noise. The Clap Reverb Disable switch (below the three small pots) turns off this pulse, leaving the dry, stark, and potentially extremely loud main pulse-cluster of the Clap circuit. The Hand Clap Density pot (red knob) controls the density of this cluster of pulses, from being very light (ACW) through normal, to each pulse being bigger, to all pulses being much louder and joined together (CW). The Noise Level pot (white knob) controls the output level of the internal White Noise Generator. ACW creates a somewhat lower than normal level of noise. 12 o-clock creates a somewhat higher level. 3 o-clock creates a much higher level. Fully CW produces an extreme level of noise such that the Tom "rumble" circuits are occasionally overloaded, even when not being triggered, so there will be sporadic crackles through each of whichever of the Tom/Conga channels are in Tom mode. The Snappy pulse of the Snare Drum. Increased noise levels make this a very strong pulse indeed. The Rumble pulse of the Toms. High noise levels lead to more rumble to the point of completely unphysical rumbles and muffled crackles, including when the Toms have not been triggered. The Maracas sound is based on this signal, but it is hardly affected by the noise level. The Hand Clap sound, both the pulse-cluster and the pseudo-reverb, is based on this noise source. Higher noise levels lead to gutsier and potentially very loud hand-clap sounds. It is generally best to disable the Hand Clap Reverb when high noise levels are used. The resulting clap sounds, especially with the Density control turned somewhat to the ACW and with the Noise Level pot set to about 2 o'clock, are a unique and gusty discrete sound. Since these are generated from real analogue noise, no two Hand Clap sounds are the same. * The Accent Button forces Accent on even if the internal sequencer's pattern has no Accent on the current beat. This Accent state also drives the 4 Level Accent system. In mid-2014 I introduced an optional Accent Input socket. 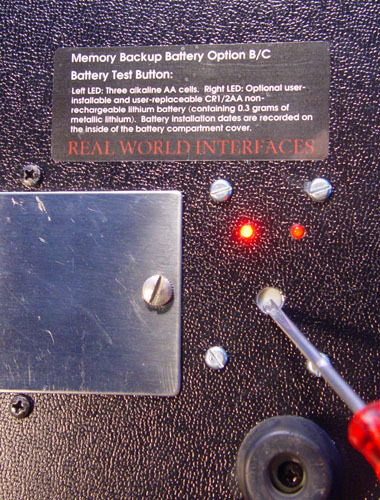 This 3.5mm input socket, mounted on the right of the machine, enables external audio or CV input signals to turn on the Accent, if it was not already turned on by the Internal Sequencer or the Accent Button. The detector circuit uses a +1.1 volt detector circuit similar to that of the Dynamic Bank Switching system mentioned above. This socket is the leftmost of the five shown in the photo above: #DBS-switching-sockets-photo. The LED, which I introduced in 2019, is between the Accent button and the Noise pot. There are three audio signal inputs. (6.5mm mono sockets on right side.) When an audio signal is plugged into one of these, that signal takes over the role of an internal noise signal. These are not to trigger drum sounds - they are signals from which drum sounds are made. Cymbal / Hi Hat Alternative Noise Input. Normally the Cymbal and Hi Hat sounds are created from a mix of 6 square-wave oscillators. This signal is filtered, distorted in a gating circuit (which controls the volume) and filtered again. By plugging an audio signal into this socket, the signal from the 6 square-wave oscillators are no longer used and the Cymbal and Hi Hat sounds are made from the input signal instead. Bright, high, chord sounds are an obvious choice of signal - they cause the Cymbal and Hi Hat sounds to be metallic shimmering (low level) or mashed and splattered chord-related sounds. Playing a single pitch into this signal results in single-pitch high-pass filtered square-wave Cymbal and Hi Hat sounds. The Cymbal and Hi Hat circuitry is beautiful, inspired and unique to the TR-808 and TR-606. This Alternative Input enables the creation of many bright, delicate and potentially wild sounds. It is my favourite part of the TR-808. 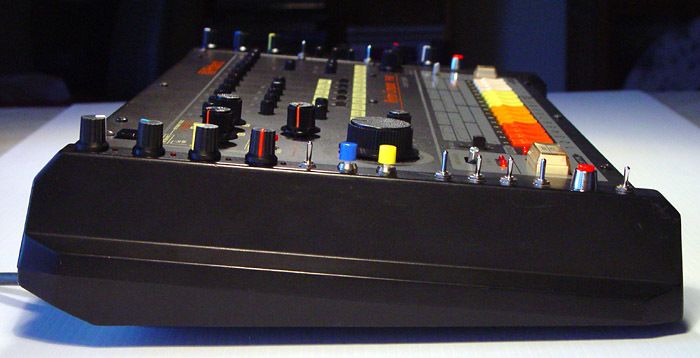 Each TR-808 has a unique tonality to its Cymbal and Hi Hat sounds, due to each machine's six square wave oscillators having a unique set of frequencies. As demonstrated in one of the sound recordings sounds/ it is possible to use this socket as an output for this mix of six square waves - by inserting a plug gently until it touches the tip contact of the switch, but not hard enough to lift the tip contact from the normally closed contact. Then, it is possible to record a few minutes or whatever of this mix of square waves. This can be played back into a second TR-808 via this Input, and the second machine will have the tonality of the first machine, assuming the playback level is adjusted to match the required signal level. This recorded signal could be subject to manipulation by changing its playback pitch, but distorting it, by adding reverb, random vibrato or whatever via audio editing software, so the original tonality could be used in the same machine, with various changes. Hand Clap and Maracas Alternative Noise Input. Whatever signal is input here replaces the internal white noise generator's signal in the Hand Clap and Maracas circuits. Random mid-range to high frequency noise, chords, distorted and/or reverberated chords or various other signals result in staccato Hand Clap sounds which are unique to the Modified TR-808 and would never result from conventional synthesis techniques. These can be musically dramatic - please check out the recordings in the sounds/ directory. This socket (and the next) can be used as an output for the internal noise source, with the same technique as described above for the CY/HH Alternative Noise Input. It is (in audio terms) "white" noise - real noise from a reverse-biased transistor junction going into avalanche breakdown. There are many other sources of noise in the modern world, but this is a source and it might be handy. The volume and to some extent the character of the noise will vary with the setting of the Noise Level pot. There's no significant difference in the audible quality of the noise between one TR-808 and another, other than the effects of TM4 inside the machine (for a standard TR-808) or the Noise Level pot (on a modified TR-808) which affects the white noise level sent to the Snare, Toms and the Hand Clap / Maracas circuit. Snare Drum Alternative Noise Input. This signal replaces the internal white noise generator for the Snare Snappy noise pulse circuit. 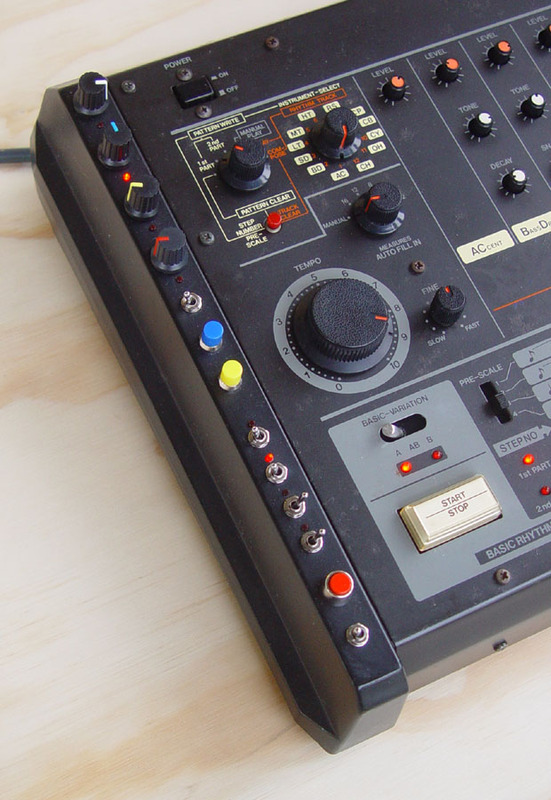 There are three approaches to MIDI interfacing the TR-808. The prices are at prices-au/#midi and prices-int/#midi . The first and most comprehensive option is Kenton's MIDI In and Out system, for MIDI Sync and Notes, both in and out. The manual for this is available from the Manual tab of: http://www.kentonuk.com/products/items/sockets/roland/tr808.shtml Many TR-808s have this interface, or an earlier version of it, already installed. Alternatively, I can purchase a kit and install it, though this will take a while since the kits are made to order in the UK and there will be another week to ten days shipping. The Kenton interface has three 5 pin DIN sockets on the right panel. The original locations do not suit the Sound Mods, so as part of the Sound Mod work I relocate and label them as you can see in a photo above. Here is a PDF TR-808-Kenton-MIDI-interactions.pdf describing the interactions between the Kenton interface and the Sound Mods, 32 Bank Memory system (potentially with Dynamic Bank Switching) and the 4 Level Accent system. The second approach is the RWI MIDI In system for MIDI Sync and MIDI notes In only: TR-808-MIDI-In.pdf . This receives MIDI notes on Channel 10, though I can configure this to a different channel of your choice. The MIDI note numbers are mapped to drum channels according to General MIDI. I can configure these as you choose as well. (If you or your technician has an EPROM programmer, it is also possible to edit the firmware to alter the receive channel and note numbers.) In the list below, the entries in grey are additional note numbers to match similar drums in General MIDI. The Auxiliary Trigger Out produces a 0 to 10 volt trigger pulse, according to the velocity of the MIDI note for C 5 (84). This might be used for driving various modular synthesis modules. 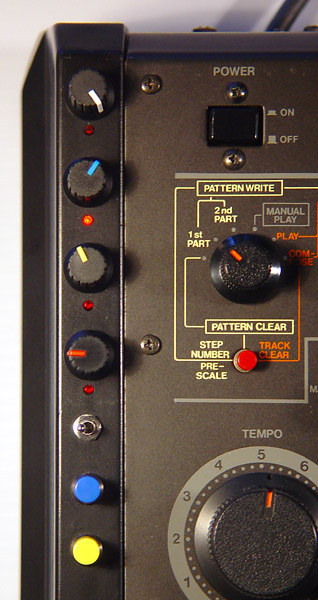 The third is the RWI MIDI Sync In only system as described here: TR-808-MIDI-Sync-In.pdf. It receives Sync in a similar manner to the RWI MIDI In system, and can use the Sync Lead in the same way. Both these RWI systems can work with the optional Sync Lead: ../dfish/sync-lead/ to drive the DIN/Roland Sync signals created by the interface from incoming MIDI Sync messages, to one, two or three slave devices, such as other TR-808s, TR-606s or TB-303s. If three is not enough, we can make Sync Leads with more plugs for slave devices. Here is a chart depicting the major distinctions between these three approaches to MIDI. For the full details, please refer to the above-linked PDFs and the Kenton manual. TR-808s are now about 37+ years old. They typically require some cleaning and fixing as part of doing any modifications. TR-808s use ALPS tact switches which are open to dust. I replace them with sealed Omron tact switches which have a similar feel. Since these are sealed against dust and liquids I expect they will last a very long time, such as decades, rather than the few years it typically takes for the unsealed ALPS switches to become erratic. I fix Volume pot noise problems by dismantling it and cleaning it with isopropyl alcohol. The 22 small pots (without knobs) sometimes become noisy. I clean them in-situ with isopropyl alcohol and compressed air. Likewise the prescale slide switch, the Tom/Conga slide switches, the two left-right toggle switches and the Tempo and Fine pots. The output sockets and small red pushbutton switch have not, in my experience, given any trouble. In 37 years of working on TR-808s, TB-303s and TR-606s, I never observed a failure in the rotary switches . . . until one was flaky in a TR-808 in late 2018. This is a very good reliability record. The key-switches for Run/Stop and Tap are prone to failure. I have a fairly involved method of repairing them, but ideally there would be replacements for these which were less prone to failure. I have used a set of replacement switches with matching 3D printed buttons from Social Entropy.com, with great success. However, these are no longer available. Thanks to the sleuthing efforts of some people who collect Cherry key switches, I should soon (by mid March 2019) have some new old stock Cherry key switches which can be adapted to take the place of the original key switches. These should prove to be highly reliable, since they have metal-to-metal contacts, while the originals relied on conductive rubber, which can degrade and rendered non-conductive by oil and solvents. I have developed self-adhesive laminated replacement orange labels for the START / STOP and TAP buttons to replace those which may have been lost, including if the top plastic cover is missing. The black random-weave dust covers around the shafts of the slide and toggle switches may become ratty after a few decades. I can replace these with similar shaped covers cut from a black shiny woven fabric used for BBQ hotplate liners. These should last for centuries. Some TR-808s have corrosion on their right-hand circuit-board (Cowbell, Cymbal and Hi Hat). This appears to arise from contamination in the factory, and can develop over decades into potentially severe corrosion of parts of the circuit board and its components. This is rare and not disastrous, but a bad case can take several hours to fix. I can install back-to-back high-current diodes in the ground lead so that there is a 0.5 volt float between the ground pin of the mains cable (assuming it is a three pin power plug) and the chassis and ground of the TR-808. This will eliminate various ground noise problems which might otherwise be caused in some circumstances. Some people in 220-240 volt countries such as Australia (230 volts) have a TR-808 which was built for the Japanese market (2 pin power cord and 100 volt power transformer) of for the North American market, with a 115 volt power transformer. I can install a toroidal power transformer and make some changes to the internal power supply so that the machine runs on 230 or 240 volts. The toroidal transformers I have used since 2018 have two windings in series, so they can be rewired in parallel to run on 100 to 120 volts. If anyone from a 100V to 120V country has a 220V to 240V TR-808, I may be able to transplant an older power transformer to make it operate from the lower mains voltage. Some of these original 100 to 115 volt transformers buzz a little, but the new toroidal transformer has no mechanical buzz whatsoever. This is a separate set of modifications for the TR-808, whether or not the machine has a 32 Bank Memory system installed. (With the TB-303, the new memory backup battery arrangements are part of the Devil Fish mods.) The purpose is to provide a more robust and convenient backup power system for the memory system than is possible with the original arrangements, which involve three AA batteries in the battery compartment in the bottom panel. For customers outside Australia, we normally ship the modified machine with the lithium battery in the internal battery holder, using Australia Post's International Express service. Customers can replace this 1/2AA cylindrical cell. For both Options B and C, the three AA cells (it is best to install only alkaline cells) can still be used to provide backup power to the memory system. A large capacitor enables the machine to retain memory contents for a longer period than usual without these three AA batteries and without the machine being run from an external power supply. There is an internal holder for a cylindrical "1/2 AA" lithium battery, which can be accessed by removing the right part of the case. This is the same type of battery we have been using in Devil Fishes, TR-808s and TR-606s since 1996, except that it is the version without leads, so it clips directly into a suitable battery holder. With the 1/2 AA lithium battery in this holder, there is no need for AA alkaline batteries. The lithium battery should last for ten or more years. This modification provides an easy way of testing the voltage and connectivity of the three AA batteries, if any are installed, and the internal lithium battery, if one is installed in the holder. For customers in Australia and overseas, we ship the machine with the lithium battery installed, but we do not install new AA alkaline batteries, since these are not needed once the lithium battery is installed. Turnaround time is likely to be a month or more. We have some good boxes to pack the TR-808 in for the return trip to customers. I have not included a price for installing new LEDs - the A, B, 1st Part and 2nd Part LEDs and the 16 LEDs in the Step buttons. I can do it, but it is inordinately difficult to install new LEDs in the Step buttons, even when I am removing the buttons to replace the tact switches. The original Red LEDs are fine and I recommend leaving them as they are. The second and more common type had the same arrangement of memory banks, but I replaced the thumb-wheel switch with two push-buttons and a 7 segment LED display. See documentation below. Sound controls. As described above except for the items with an asterisk and with different arrangements for the Alternative Noise Inputs. Four level Accent system, as described above. This is the manual for the original ca.1995 MIDI In system, with full velocity control of each drum channel, an extra 0 to 10 volt velocity sensitive trigger output and Sync reception.